Isoflex designs and manufactures specialized, high-performance engine isolation mounts and flexible couplings for both commercial and pleasure marine applications and a wide range of industrial purposes. Isoflex polymer and stainless steel components and patented thrust block system provide superior engine stability and high resistance to degradation and impact in hostile and petroleum environments. Isoflex catalogs are available online here. If you prefer a printed catalog, complete our catalog request form and we will mail one out to you. Engineering support as well as 2D and 3D drawings are available upon request. 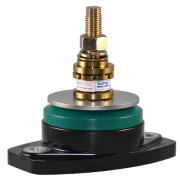 Isoflex isolators and mounts are made with a stable, engineering-grade polymer instead of rubber to specifically resist oils, fuels, water and hydraulic fluids while providing at least 85% vibration isolation at the worst case engine idle scenario. Isoflex vibration isolators are a direct replacement for most common marine engines and mounts. Isoflex couplings are specifically designed to fail before any damage occurs to the gearbox. They assist engine mounts to do their job by allowing controlled engine movements to isolate vibration. Our couplings are designed to cover a large percentage of Twin Disc and ZF gearboxes, plus many other transmissions found on the market. What are Isoflex mounts made from? Isoflex mounts and couplings are made from an engineering grade, heat-cured polymer that provides significantly more resistance to elements than traditional rubber used in similar products on the market. Isoflex polymers resist oils, fuels, water and hydraulic fluid. No. In most cases, Isoflex mounts are supplied on a custom basis. Things such as placement of the mounts and the working conditions of the engine are taken into account. Our Sizing Worksheet outlines some of the information needed to determine a suitable mounting system. How important is the actual installation of mounts into the vessel? Proper installation is critical to the life expectancy of the mount. It is critical that the top of the engine bed is parallel to the base of the engine bracket in all planes, to avoid any pre-load on the Isoflex mount base, stud and core material. Isoflex recommends that installations be carried out by certified technicians. What is the difference between hard mounting and soft mounting? A hard-mounted engine means the engine is bolted directly to the bearer. Often times this leads to vibration issues and can cause fasteners to loosen, welds to give way, and machinery to prematurely wear and/or fail. Using an isolator, also known as soft mounting the engine to the bearer, significantly improves the ability to isolate harsh vibration. This creates a boundary between the machine and the bearer that does not allow this vibration energy to travel into the structure. For safety, comfort and performance reasons, it makes good sense to soft mount by using the appropriate isolators. Are the standard mounts that are supplied with my engine configured for my particular installation? No. In our experience, the mounts that are supplied with your engine are generic. They are supplied with a particular engine model, but the gearbox reduction can be different, resulting in different thrust figures leading to varying amounts of axial movement. The same engine can also be fitted to various different craft, which have different requirements and working conditions. Are all engines four-point mounted? No. Applied power and configuration may require four-, five-, six- or eight-point mounting to achieve the required axial movement while still reducing the engine vibration levels throughout the RPM range. (We prefer six-point mounting with down-angle, drop center or V drive applications. I have my transmission information. Which coupling do I need? Isoflex makes couplings to use with a variety of transmissions. This information is provided by manufacturer and is provided in our Isoflex Coupling Catalog. What if I don’t find a coupling cross reference to my transmission? If you don’t find a proper cross reference “fit”, use the step-by-step measurement instruction to complete the information for your specific gearbox flange. This will determine the correct coupling type (4-bolt, 6-bolt, 8-bolt or 10-bolt pattern). 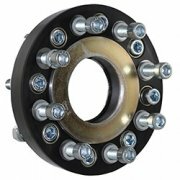 Do I need to calculate the torque rating for a specific coupling installation? Isoflex strongly suggests that you calculate the torque rating for your specific installation. As long as your torque rating is less than or equal to that of the Isoflex coupling you want to order, your Isoflex product should work very well. If your torque exceeds that of the posted Isoflex rating for your coupling, please contact us to discuss a custom coupling. Find the corresponding working torque ratings of Isoflex 4-bolt, 6-bolt, 8-bolt and 10-bolt couplings in the Coupling Catalog. My stud broke. Are yours stronger? Isoflex offers a swivel adjuster system and high tensile, reinforced studs, making them stronger than most others on the market.